The Navy accepted and commissioned the USS Holland in October of 1900. 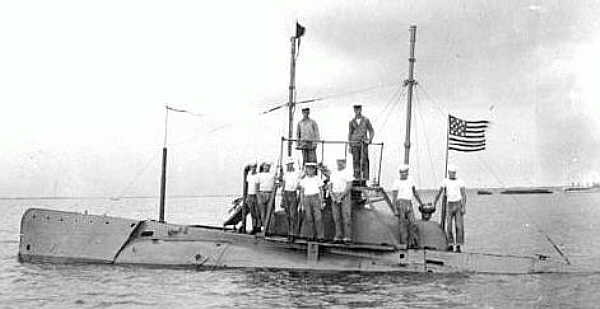 It was the first of an unbroken line of commissioned submarines in the United States Navy. John Holland had already built a follow-on design, the Fulton and showed it to Naval Officials. The Navy wanted more boats and put in an order for seven to be built along the lines of the Fulton. The first was laid down in New Jersey the following month. By the spring of 1901, all seven were well in hand in two shipyards. On the west coast were the A-3 and the A-6 at the Union Iron Works in San Francisco. In Elizabethport, New Jersey the A-1, A-2, A-4, A-6 and A-7 sat side by side in the Crescent Shipyard. The construction technique was different by a long shot from anything we see today. Welding was non-existent. Everything had to be either cast into the desired shape or fabricated from rolled steel which was then either bolted or riveted together. Welding some angle or channel iron to build foundations and brackets could be done. Frames of rolled T-stock or Z-stock were erected about 18 inches apart. These frames had pre-drilled 3/4" holes around their periphery. Rolled and hammered 1/2" oil tempered plates some 70 feet long and about 8 feet wide with tapered ends were laid against the frames and holes marked. The plates were then drilled with more 3/4' holes to match the holes in the frames. The plates then were re-laid along the frames again and the rivets inserted. The rivets were inserted red-hot from the inside then backed up by a hefty man with a backing piece. On the outside, the hammer man either with and air hammer or a hand hammer peaned the protruding end of the rivet into the countersunk hole in the plate. The plate above was overlapped by nearly a foot and a double row of rivets spaced about two inches apart hammered properly to make a pressure-tight seal. Burrs and rivet heads that protruded too much were filed off, by hand. The work was brutal. These things were started and finished in the winter-----in New Jersey----outside!!!. Tank plates assembled at the same time as the hull and its frames were fabricated the same way. Ballast tanks were in the center of the boat and in a saddle shape, the bottom of which was the pressure hull. They carried well past the horizontal centerline on the sides and formed enclosing wings. The tank top was flat and formed a floor for the battery cells. Forward, under the torpedo tube was the gasoline tank. The forward trim tank wrapped around the tube. The after trim tank was under and a part of the foundation for the thrust bearing on the main shaft. Atop the center of the pressure hull, a large cylindrical casting was inserted. Merely thirty-six inches in diameter, the cylinder was closed at the top by a hatch, twenty-four inches in diameter. This was the conning tower and one of the only two hatches in the boat. The other was over the engine. The engine was gasoline fueled, four cycle and had four cylinders. But that is where the resemblance to the modern automobile engine ends. The cylinders were about 7 inches in diameter and had a stroke of nearly a foot. The engine could be turned over by hand, by the electric motor or air started. It was started on one cylinder only then as it was turning over the others were cut in by adjusting the fuel and spark. The thing had to be tweaked constantly. It only ran in one direction so backing down was out of the question. There was only a limited speed adjustment. Half speed of about 4 knots and full speed of about 8.5 knots were the choices. It would develop 180 horsepower when running properly. Flanged fittings bolted up with no lockwashers or lockwire, pipe thread with only lead paste to form a gasket, no swage fittings or compression joints, the piping system was a nightmare. Being gasoline fueled, there was the problem of leaks and fumes. The fumes could build up and cause two problems. First was the obvious fire problem. The fire would be sudden and disastrous. The second problem was the effect of the fumes on the brain. They tended to accumulate low in the ship and caused displacement of the oxygen and slow asphyxia. The symptoms were an euphoria which overcame the crew and impaired their judgment. The next step was fire or death by suffocation. Lubricating oil was splashed into the bearings in the semi-open crankcase and the oil cups were gravity feed and had to be reused by filling the oil cups from a can. The term oiler had real meaning. Working around this engine with all its open moving cams, crankshafts and rods made it a dangerous time to be a machinist. Aft of the engine on the main shaft was a hand operated band clutch. Next in line was the 70 horsepower open winding DC motor. Powered from the battery, it drove the shaft at some 400 rpm. It was reversible and had some speed control so it was used for maneuvering near the dock. The shaft also drove, through a set of friction clutches, the air compressor and ballast pump. Full speed submerged was seven knots and could be sustained for about four hours. Nestled inside the wings of the main ballast tanks was the battery. Here was a monster. Admiral Lockwood called it the "Fiery Devil and the Green Death". It was a lead acid battery, lead plates and sulfuric acid as electrolyte. It was the same general type used today. However, there were some significant differences. Today's battery is closed in a hard rubber and plastic cell jar that holds the electrolyte and plates. The electrolyte is stirred by an air lift pump similar to an aquarium's pump. The plates today are specially designed to minimize gassing, and we have good ventilation with accurate hydrogen detectors. None of these were present on the A-boat. The battery cells were steel boxes lined with a layer of rubber and a layer of lead and wedged in place with waxed maple wedges. The boxes were open topped and the plates were hung by extenders on the top of each plate to from the top of the cell jar. The positive plates were connected together with a soldered bus bar of lead coated copper. The negative plates were hung and connected in a similar manner. The cells were then connected in series with intercell connector bars as our batteries are today. The cells were wedged in place in the steel box that was bounded by the ballast tanks and the fore and aft half bulkheads. The box was lined was lined with lead. The top of the battery well was covered by shellacked oak planks about 3 inches thick and 16 inches wide. They stretched from side to side across the well and rested on a lip on each side of the well. The planks, when in place were covered by a rubber sheet then a shellacked canvas walking cover. If any maintenance or monitoring of the battery gravity or temperature had to be done, the planks were taken up then replaced when the readings were done. The cells could be cut out of the circuit and repaired by replacing acid and plates. The space above the cells was ventilated by air leaking down around the planks and drawn off to be exhausted over the side by the battery blowers. There were sixty cells in ten rows of six cells each and they could develop an 1840 amp hour discharge rate for 4 hours. Being a lead acid battery which used a chemical reaction to provide electrical power, the battery had a few other chemical reactions which had to be taken into consideration. First, when being charged, (and to a lesser extent while being discharged at a high rate) the battery generated hydrogen gas. This gas was highly flammable at a four percent concentration in air and explosive at a seven percent concentration. If the battery were improperly charged or improperly ventilated and the concentration could build in a hurry. The results were lethal. This was the Fiery Death. Another gas generated by the battery was hydrogen sulfide. The rotten egg smell of this gas permeated everything. Then there was chlorine. The battery was in the center of the boat, covered by a deck of loose planks, rubber sheet and canvas. Directly above the deck was the conning tower and the main hatch into the boat. The top of the hatch was three feet above the waterline with the original design and five feet with the later conning tower. Any seawater coming down the hatch fell directly on the battery deck. If any leaked into any of the cells, the sulfuric acid combined with the sodium chloride in the seawater and liberated a pea green, heavier than air, oxygen displacing, toxic gas, the Green Devil, chlorine. If cells became salted, they were charged and discharged while ventilating the boat to get rid of the chlorine then the acid was spiked as necessary. The battery was connected to a master switchboard. Not at all what we are used to even in our worst nightmares. A single three foot wide by four foot high slab of two inch thick marble, supported by steel angle and channel was mounted vertically on the starboard (port on some) side of the boat. On this slab were mounted two double pole, single throw knife switches that were the battery breakers. one for each half of the battery. Above them was a double pole, double throw knife switch which could hook the battery halves in series or parallel. There were separate single throw single and double throw knife switches for the battery blowers, auxiliaries and lights. A large double throw knife switch was the ahead and reverse lever for the main motor. Seven single pole knife switches in a row were the starting resistance cutout switches. These starting resistors of german silver were mounted either in a separate box or on the back of the marble slab. A motor field switch and motor field rheostat rounded out the list of items on the switchboard. There were no other switchboards or distribution boxes. That was it. It was all open switches, open wiring. Battery voltage varied from 70 to 160 volts DC. It was a dangerous time to be an electrician. Up front was a single 18" diameter torpedo tube. 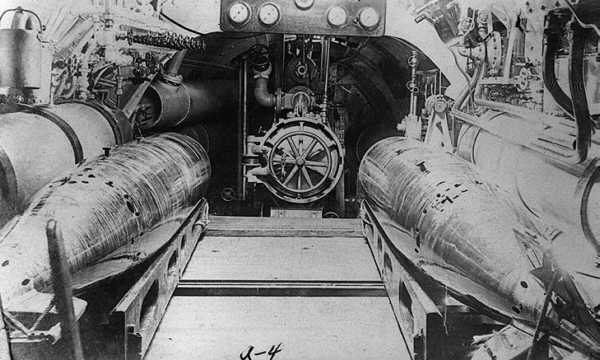 The boat could carry one torpedo in the tube and two in the boat on each side of the middle space (where the battery well was). The torpedo man who took care of the torpedoes was a real craftsman. The fish was powered by high pressure air which powered a four cylinder air motor. It was a straight runner, with only a rudimentary (and not very reliable) depth control. Each fish had to have its gyro set up in the shop and tweaked prior to loading. Taking on the torpedo was interesting as it was loaded into the tube then brought into the boat. After each firing, the torpedo had to be recovered even if it meant dragging the bottom then diving to hook on a line. It was then reloaded, dismantled and prepared for another launch. To submerge the boat was quite an evolution. Lets assume that the boat had just transited to its operating area and the CO decided to dive. First he rang up ALL STOP. The engine was shutdown and the clutch between the engine and motor was disengaged. A couple of men unshipped the two ventilation pipes and struck them below. The masts, if up were taken down (although that was not required). The crew went below, shutting and clamping the conning tower hatch. Still stopped, safety tank was flooded, then the ballast tanks. These tanks had vent valves which vented the air into the interior of the boat. The vents were opened then large kinsgston valves (lever operated valves which shut with sea pressure) were opened and admitted water to the tanks. If the ship was properly ballasted, it should sink until the conning tower upper end was just at the surface. The CO ordered ahead half speed ahead. The electrician at the switchboard, made sure all the switches for the main motor starting resistance were open, checked the field rheostat at minimum, smartly shut the motor field switch then the motor reverser switch in the ahead position. Then reaching up, he shut each of the starting resistance switches in turn. After the motor comes up to the minimum running speed, the electrician adjusts the motor field rheostat to adjust the speed to the ordered shaft turns. The planesman cranked some up angle on the stern planes to give down angle to the boat. He had to turn the handwheel that was connected to linkage from the middle of the boat to the aft end of the main motor. The gears were attached to a quadrant gear which drove the linkage to the planes and rudder. No power assist. With a little down angle the boat started down. Normally, the boats ran at either 16' depth (measured at about the mid level of the boat) or at 60 feet. It was not an easy life, but the hardship bonded the crew. Each man had to know all that had to be done and lent a hand when required on any job. Ensign Charles Lockwood, when about to be checked out for final qualification to command the A-2, was introduced to a new concept. The crew had been briefed by the old CO and the Division Commander ahead of time and as Lockwood took the boat down for his qualification dive, all hell broke loose. The boat seemed heavy and there was the sound of rushing water from aft. Someone yelled that they were leaking through the engine exhaust and the bilges were filling. Just then someone else yelled out that they smelled chlorine. The boat took a lurch with an up angle and the lights went out. He ordered the boat to the surface. After the boat leveled out on the surface, and the lights came back on, Lockwood noticed all the crew men had grins on their face and the flooding and chlorine problems seemed to have vanished. The Division CO and the crew had pulled a drill. It was realistic, well rehearsed and a complete surprise. Lockwood did well but was really upset by what he felt was a trick played by the crew. When it was explained that this was a way to demonstrate he could handle the boat, and that he had done well, thus earning the respect and trust of the crew, he felt much different. The tradition of casualty drills has been an integral part of the submarine force since the earliest boats. The class was built from plans of the Electric Boat Company. The plans were John Holland's seventh, the sixth being the Holland. The first of the class is normally the one with the lowest class number and the first to be laid down. Not so in the A-Class. The A-1 was the USS Plunger. She was slightly different than any of her sisters. 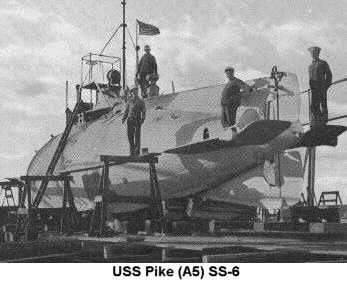 The first boat laid down was the A-2, USS Adder. Thus the class became known as the Adders. There was a class prototype built, the Fulton. It was tested by EB then when the Navy didn't buy it, EB sold it to Russia to compete with Simon Lake who had already sent his submarine,'Protector' over and was looking for contracts for more. He got a contract and built five boats at Newport News Shipbuilding. Adder and her sisters were built and from their commissioning until 1908 taught the Navy much about the submarine and its capabilities. Formed into an operational flotilla in Newport, RI in April of 1904. Adder, Moccasin, Porpoise and Shark operated out of Newport, Rhode Island and Suffolk, Long Island. Grampus and Pike operated out of San Francisco and San Pedro, California. Then in 1908 most were put out of commission. There were two new submarine classes in the water and the Adders weren't needed anymore. --- Here that is. They were needed to help defend Manila Bay. 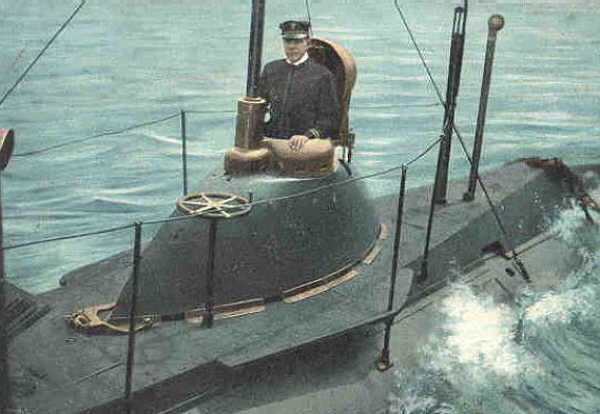 Admiral Dewey had said that if the Spanish had possessed one submarine in the bay in 1898, he would not have attacked. The boats were stripped down and loaded aboard colliers to make the trip. Porpoise and Shark were first. They went aboard the USS Caesar (AC-16). Loading in Newport, Caesar made the trip across the Atlantic, through the Med, through the Suez Canal and across the Indian Ocean to Manila from April to August of 1908. Once the ship made port in Cavite, she off loaded the boats by pushing them overside on skids. Thus the Porpise and Shark were the first US submarines through the Suez Canal and the first to be launched twice. (Holland was launched twice, but only once as a Naval ship). The following year, Caesar made another trip carrying the Adder and the Moccasin. In late 1912, the USS Ajax (AC-15) carried two of the B Class (B-2 and B-3) to Manila. In 1915, the USS Hector (AC-7) took the two west coast boats Grampus and Pike and the B-1 to Manila. Thus by the end of 1915, the Manila Bay flotilla consisted of six A-class boats and three B-class boats. The first advanced base. The first WestPacs and the Opening Of Olongapo. These boats escorted ships into and our of Manila during WWI and performed the tasks of a "Fleet in being" that is one whose presence deters an opponent even if it makes no patrols and sinks none of its foes. After the war, they were worn out and used up. By 1918 the S-boats were being built. As far a leap in 18 years as we made in the period from 1945 to 1963 when the diesel boats were being replaced by the nukes. The Adders were put out of commission for the last time. They stayed anchored and alongside used for oil tanks and water tanks until 1922. The Navy designated them as targets and they were towed to a position probably north of Corregidore and sunk over a period of time by gunfire of destroyers. As near as we can find out at present, they are still there. The A-boats were the first in many ways. In one, however, they showed the way the submarine force would be. Ensign Lockwood was most disappointed to be assigned to the USS Monterey for duty in submarines. He was told by some of the officers already there that the submarine would get in your blood and soon either you wouldn't be around or you wouldn't trade the boat for duty on anything else. He discovered within six months that they were right. The man who was Commander Submarine Force Pacific during the last three years of World War II was never the same. It would be the same for many of us. Note: All photos not otherwise credited are courtesy of Ric Hedman. Please see Ric's A-Boat listings and photos at his Through the Looking Glass website. Additional US Navy photos are also available.